Offering the widest range of industrial dispensing cartridges for use with a wide range of adhesives, gels, epoxies, silicones and lubricants. All cartridges are industrial grade safe for use to 100 psi air pressures and are certified silicone-free. Featuring a 1/4 Inch NPT industry standard thread for secure attachment of nozzles and fittings. Disposable plastic cartridges are available in 2.5, 6, 8, 10, 12, 20, 32 oz. (approximate metric value 60, 175, 237, 310 355, 590, 960cc). Available in high-density natural polyethylene, all sizes are fitted with a 1/4" NPT (6mm) female thread dispensing orifice. Supplied in sealed packs of 10 or bulk packs available on request. Cartridges are capable of handling a wide variety of chemical fluids for storage and dispensing and can be easily adapted to both pneumatic and manual application systems. Cartridges are commonly used in single component or pre-mixed and frozen applications with polysulphides, solder pastes, adhesives, epoxies, urethanes, greases, acrylics, etc. Plungers are for use with dispensing cartridges. The plunger is inserted into the cartridge once filled and moves consistently down the inner walls to ensure all material is dispensed without waste. Plungers can be used at pressures up to 100psi, for example when used with a pneumatic cartridge gun system. Kits are supplied with the same number of cartridges and plungers in the box. Kits supplied packaged with (10) cartridges and (10) wiper plungers. Supplied seperately ready for filling and the plunger being inserted. 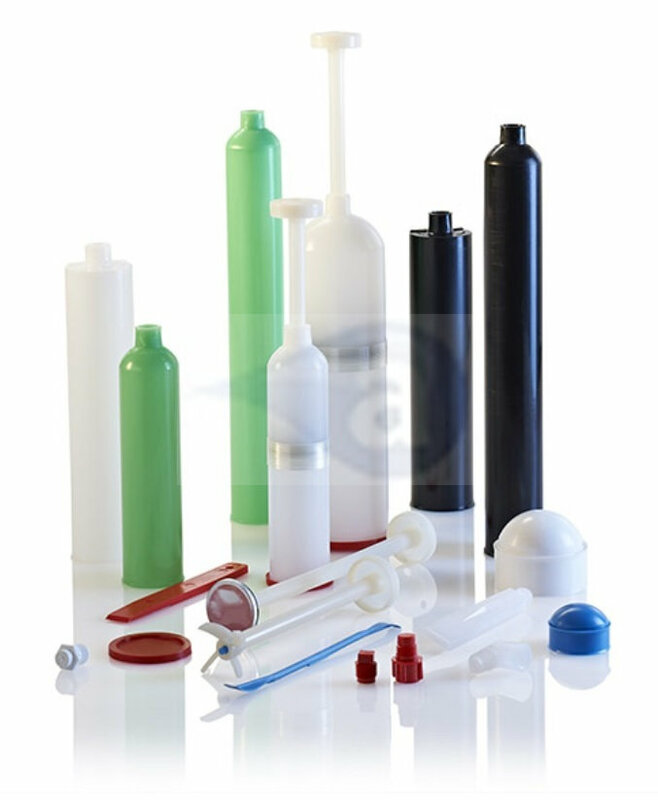 High density polyethylene (HDPE) cartridges. Medium density (MDPE) which is a softer material for the wiper plungers. High density polyethylene (HDPE). More rigid plastic material. Low Density polyethylene (LDPE). More flexible plastic material. All cartridges feature the 1/4" NPT thread for nozzle attachment. Plungers provide a wiping action inside the cartridge. Use a plunger to reduce material waste. Select plunger to match cartridge size. Polyethylene material. Cartridge tip caps thread (1/4" NPT) to the nozzle end of the cartridge. Cartridge end caps clip onto the top end (flange) of the cartridge. All caps are reusable. Typical Applications:- Handling of different pastes, gels, adhesives, sealants, glues, epoxies, silicones & general adhesives.